This miniature McD’s is located in front of Lucky Plaza, near Topshop, and across the street from ice cream sandwich vendors who use actual bread, and the Wisma Atria mall, home of the delicious Food Republic. After doing some research, a bunch of websites have proclaimed the smallest McDonald’s in the world is located in Tokyo, Japan. 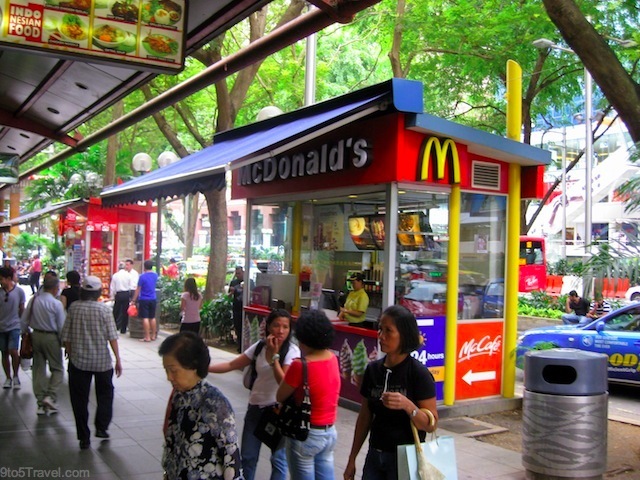 However, the photo (the sites have all published the same one) they claim is the “Tokyo” restaurant is wrong – it’s actually a picture of this very McDonald’s in Singapore! In our photo above and theirs, you can clearly see the Wisma Atria mall in the background. So where’s a real photo of the Tokyo McDonald’s? Or have people just confused these two very different Asian cities? Regardless, this location in Singapore is the smallest McDonald’s we’ve ever seen!